Cleaning tableware and cutlery was a big job for 19th century servants and housewives. This was particularly true in large households, which normally had silver dinner services with enough cutlery and delpht for at least 20 place settings. Warm soapy water was used to clean the cutlery, but knives and forks were a difficult proposition. Made of pre-stainless steel, they had to be cleaned on wooden boards, then rubbed with leather strips to remove any stubborn stains. 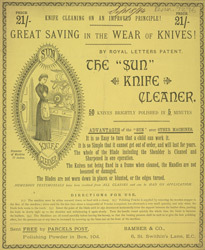 Knife-cleaning machines such as this made the job much faster and easier, but came at a relatively high price.